…/… Following 911, I expected French friends and acquaintances of mine who came back from visits to the U.S. to return with some sense of respect or admiration. Don't kid yourselves! Many shared the same tone of exasperation and disbelief in their voices: How can one be so patriotic (that is, so superstitious)? …/… We have seen many a time on this weblog that by simply doing a little digging, it appears that so-called humanistic activists (whether in the shape of intellectuals, groups, national leaders, or countries) are not as neutral, idealistic, and lucid as they seem to believe themselves, but present many an inconsistency, often more than the Americans they criticize. Thus it is with patriotism as well. In contrast to the irony expressed when dealing with American patriotism (and that of other Western countries), they seem often to lose all their marbles when confronted with the national pride of developing countries. They can only marvel when third-world countries (or, rather, their unelected leaders) evoke "national aspirations" and the construction and the future of their nations. writes Darrick Johnson as the Resurgent contributor (who likes — a minimum — three spaces between sentences) tackles The Cruel Hopelessness Of “Single Payer”. In the current debate over the Affordable Care Act, we really are in the midst of a great proxy war over single payer health care. Sure, its not on the table with this Congress, and Obamacare, while a bureaucratic monstrosity, isn’t single payer. But the debate surrounding GOP efforts to repeal, or at least reform the law is really a precursor to a national debate over single payer. Regardless of the fate of the GOP pseudo-repeal bill, we are at a crossroads. Obamacare is collapsing. It was never intended to be permanent. It was always a compromise, a bridge to complete, government sponsored, single payer health care. We will soon have to decide if we want a market oriented health care system, or a government dominated system. Every left-wing opinion piece on health care starts with the premise that medicine shouldn’t cost anything, and anytime it does, it’s a evidence of a failed system. They point to Canada, the UK, and European states where the socialist dreams of medicine are, we are told, coming true. Obamacare’s failures, they say, should drive us closer to “single payer”, not farther away. … Let’s look at two hypothetical examples, one, representing a worst-case scenario for free market health care, and one, representing a worst-case scenario for socialized medicine. No system will be perfect. Health care is vitally important to each of us, therefore it will be expensive; it is the definition of inelastic demand. We don’t all have the financial ability to pay for what we might need, be it through insurance, or our own money. But if faced with the choice of two terrible scenarios, – the Smith family’s hopeless “free” health care, the Gard family’s real life nightmare, or the Jones family’s expensive, but attainable care, wouldn’t you rather be the Jones family? At least they can fight. At least they can try. At least there is hope. Conservatives don’t oppose single payer because we are heartless. This fight isn’t mainly about tax rates, or deficits, though single payer is catastrophic for both. It’s about having not the cheapest health care, but the best. So that when you need a hospital bed, the market makes sure you don’t have to wait until it’s too late. So that when you have a rare disease, there is hope that the market found it worthwhile to develop a treatment. That might mean that when you have medical issues, money is a worry. You get scary bills. But you have hope. If the treatment is available, but the money is not, that can be fixed. If the health care is free, but the government doesn’t permit you to receive it…well, that’s a cruelty we don’t want to see replicated in the United States. 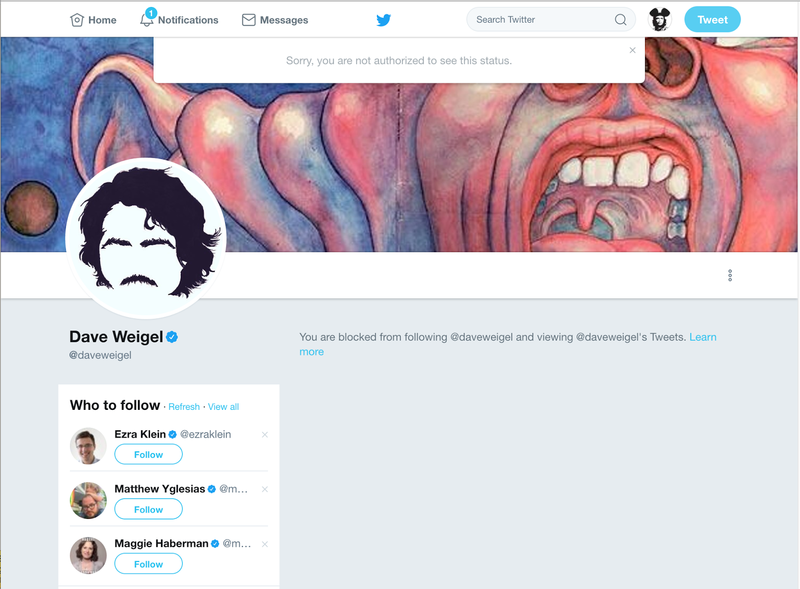 Twitter Blocked by a Washington Post Journalist re the Left's Cultural Bullying Atmosphere: Badge of Honor? It turns out No Pasarán has been blocked. … Less than 48 hours after a multiple assassination attempt on members of Congress, there were no media vans or cameras at the Alexandria baseball field where it occurred. Just for perspective, when Republican staffer Elizabeth Lauten committed the offense of writing something critical of President Obama’s daughters on her private Facebook page, news cameras were camped on her parents’ lawn staking her out for the better part of a week. When the press was covering the shooting, it was mostly a gauzy, imprecise discussion of how “rhetoric” might have caused it, which means we’re in the business of determining whose rhetoric to stifle to prevent further violence. Wouldn’t you know it? The answer was… Donald Trump’s rhetoric, which has the magical power to compel a Bernie volunteer to shoot a long-time Trump-supporting Republican. … My, how quickly we move in the news cycle from Republicans literally shot to Republican overreach about Republicans being literally shot. … What perverse standards. A Republican congressman is fighting for his life in a hospital thanks to a partisan attacker, but let’s examine on national TV several times over how he kind of had it coming because of his politics.